Stephen Keogh, born in Ireland. He followed his studies in Ireland with private lessons in London and New York. He played as percussionist with the National Symphony Orchestra of Ireland, contemporary music ensembles and many visiting jazz artists including Sonny Fortune, Eddie Lockjaw Davis, Jimmy Witherspoon, Pat La Barbera, Louis Stewart and James Moody. A move to London in 1988 led to tours and recordings with many British and American jazz artists including Stan Tracey, Charles McPherson, Art Farmer, Jason Rebello, Jean Toussaint and Benny Carter. 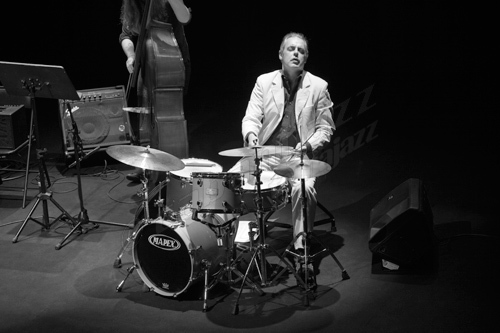 Since moving to Barcelona in 1990, Stephen has worked all over the world with many great musicians including Johnny Griffin, Lee Konitz, Harrold Land, Peter King Quartet, Brad Mehldau, Mark Turner, Herb Ellis, Benny Golson and Steve Grossman. He is a member of the European Jazz Piano Trio led by Bill Charlap, Peter King Quartet and co-leads the Urban Jazz Quintet and Urban Jazz Ensemble. Workshops/Clinics: Artistic director of Seminario de Jazz de Vilreal 2001 in Spain, artistic director of the Seminario de Jazz y Otros Musicas de Benicasim 2003, artistic programmer/consultant of the Avui Jazz Concert Series, Spain, drum/percussion tutor at the Louis Stewart Jazz School West Clare in Ireland 1999 - 2003, principal tutor at the Percussion Summer School Leeds University 2004.